I was fresh out of USAF police and dog school training. I was 19 years old and my first tour of duty was Hahn Air Base, Germany. After arriving in Germany I was instructed to go meet my kennel commander and meet the dog that was going to be assigned to me. The military moves personnel from base to base, but dogs stay at each base and are assigned to handlers when they arrive – about every 2 to 4 years. My Sergeant took me down the middle of the kennel runs and of course all the dogs were barking. As we walked past this one dog in particular who was really snarling, spitting, growling and biting at the fence, I thought to myself, that is one mean dog! The Sergeant stops, points to that dog and says this is your dog, his name is Joe. He said that I would have some time to get to know him and told me I should sit outside his door and talk to him. I figured It would take a few days to warm up to this dog. After about 10 minutes Joe finally stopped growling and snarling, at one point, he even rubbed his hindquarters along the fence as if wanting to be scratched. Once I touched him, he whipped around super fast and tried to bite my fingers – but instead grabbed the fence, he began pulling and bending the chain link. In my mind I thought this dog is going to kill me. I just kept talking and trying to give him treats but he wouldn’t eat them, so I just sat there. Ten minutes later my Sergeant came back, before I can tell him how crazy this dog is, he handed me a leash and collar and told me I needed to take him out right now to do some training. I thought he was kidding me. He assured me Joe would be fine once the kennel door opened. I’m 19 years old, fresh out of Basic training, Law Enforcement and dog handling school — When a higher-ranking person tells you to do something, you do it. I opened the gate, walked inside. The sergeant was right, Joe waged his tail, I told him to sit, I put on his collar, off we went. Joe was displaying a behavior called barrier aggression. (I’ll blog about that classification of aggression another time). 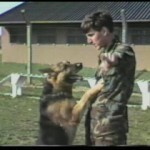 Joe and I spent 3 years together, and competed to become the best Military K-9 team in Europe. We were then flown to the U.S. to competed in a world-wide competition, where he finished 9 out of 13 dogs. I of course thought he did WAY better than that, but, oh well. I have a few more stories I think you’ll enjoy. I also have some video footage of Joe and I – It’s part of my 20 minute promotional video, supposedly debuting SOON on the popular “dog blog” Dog Star Daily. I’m hearing that a big pet supply company in the U.S. is throwing out brand new pet products and has been doing so for months. Items like dog beds, cat beds, cat food, dog food, dog and cat toys, just about everything. I of course can’t mention the name of the store, but if your smart enough you’ll figure it out. I’d love to hear from you and what you found. Good Luck! Maybe you missed one of my most recent blogs or videos? or maybe you’re just dying to know what I’m working on right now? well, here’s your chance to find out. 4. Learn about your dog: I’ve compiled a list of 5 “must read” books!. As your dog’s teacher, the best way to learn how top trainers are training dogs and teaching owners, is to read books that are recommended by top trainers. 6. Your Dog’s Name: How not to over-use it, and the importance of creating an actual meaning for it. 7. Treat your dog like a dog: This may sounds a little mean, but it’s actually the nicest thing you can do to your dog. 3. More “Think like a trainer” tips; Once I get to ten, I think I’ll stop. 4. Re-direction play method: For dogs with phobias, this method helps to re-direct their focus through attention, without giving them the wrong idea. In a dogs mind attention=praise or reward and we don’t want them thinking we’re rewarding their phobias. 6. More how to videos; clicker train your dog, Crate training, Teaching the “Down” and Go to bed. Just installed really cool editing software 10/22/09 can’t wait to put a video together. My other software, Cyberlink was good until I upgraded it, for more features (2 months ago), and all it did was freeze and crash. If you would like to request something for me to write or make a video about, send me a comment. Please subscribe with just your email and you will be notified when I post something new.